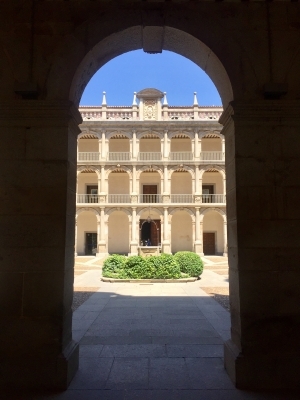 The University and Historic Precinct of Alcalá de Henares was the first city in the world deliberately to be designed and built as the seat of a university, by the concept of an Ideal City. This concept (Civitas Dei) was spread to the Americas by the Spanish settlers. In 1499, Cardinal Cisneros founded the Universidad Complutense in Alcalá, which became famous as a centre of learning during the Renaissance. His primary objective was to train administrators for the Church and for the Spanish Empire. It was at this university that the Spanish language was given its definitive grammatical structure. 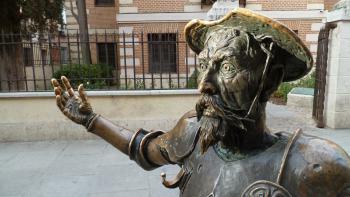 Alcalá is also the place of birth of Miguel de Cervantes (Don Quixote). Alcalá de Henares wasn’t quite what I had expected. University towns usually have a distinct atmosphere: cozy, lots of young people, interesting museums, small budget restaurants. 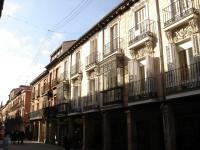 The thing about Alcalá de Henares is that its university was moved to Madrid in 1836. Only recently, in 1977, a new university has been set up. But a lot of damage had been done in the 1.5 century in between. After leaving my rental car in an underground car park, I set out for the city center. Information boards in Spanish, English and Braille guide the visitors along to the most important things to see. You’ll definitely need this guidance or bring your own map, as the highlights are somewhat hidden between the dull features of another provincial town. The cityscape isn’t very coherent, because of the many demolitions and modern reconstructions that were executed before they thought of conserving the place. ICOMOS in its AB evaluation states that the city has retained “a substantial degree of authenticity” - which I think is an euphemism. I first walked to the Archbishop’s Palace. 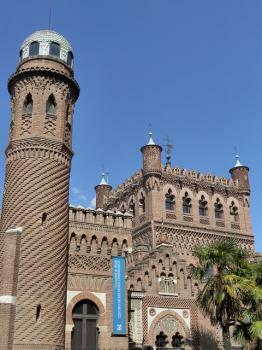 A very fine building with Mudéjar elements. The three trees in front of it in full autumn colours, a couple of passing nuns and dozens of storks nestled on the surrounding roofs gave it a bit extra. In the same area lies the Cathedral. It’s a Magistrial Cathedral, which means that the priests are also professors in University. It is known for its elaborate iron fence (?!). In the past Alcalá de Henares had separate quarters for Jews, Christians and Moslims, but not much more that an information shield here or there reminds of that. The best part of my visit was the birthplace of Miguel de Cervantes. This house is located next to the 15th century hospital, where his father worked as a surgeon-bleeder. It is quite a pretty dwelling, the family was clearly prosperous. 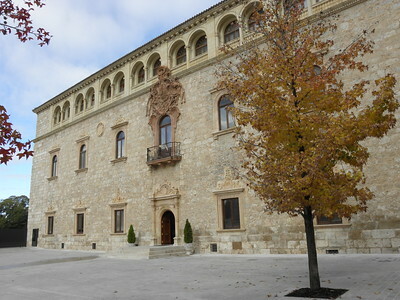 It now holds a free museum which is more geared to reenacting the 16th century than to the literary works of Cervantes. In front of it is the statue of Don Quijote and Sancho Panza sitting on a bench. The museum was full of schoolchildren, it probably is a popular school trip for the Spanish. So should this one be a WHS? It has earned its place more because of its former importance than for what is left nowadays. 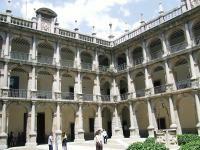 Spain already had entered its university town par excellence 10 years before: Salamanca. Sometimes, a UNESCO site collector has to make a difficult choice of seeing one site while missing others due to time pressure. Such was the case, as we were waking up in our hotel room in Madrid and brainstorming about which of the three sites to visit on our last day before flying out. We settled on Alcala de Henares, a town outside of Madrid, which prides itself on being the first planned university city in the world. Originally founded in the 16th century, the university’s urban planning aspired to approach the ideal of Civitas Dei (“the city of God”). Within a few centuries, Alcala grew to become one of the most significant universities in Europe. The highlight of the city for me was the pedestrian avenue of Calle Mayor, connecting the Cathedral to the University’s Plaza de Cervantes. The street is characterized by the rows of precariously crumbling columns which support the overhanging second floors of the buildings, thus providing a porticoed space for the shops and cafes below. Even if the street has probably seen better days, it still provides a charming walk through town. It is on this street that the birth house of Miguel de Cervantes can be found, right next to the medieval hospital where his father used to work. As for the university itself, while it boasts an impressive facade and an interesting cloister, there are very few buildings that stand out. In fact, the university closed down and moved to Madrid in 1836, and during the next 140 years, the buildings were used for administrative offices, even prisons. As a result, some of the charm and wonder of the former university town has been irrevocably lost. Alcala de Henares is around 35 kilometres away from Madrid and can be reached by Cercanias railway within 45 minutes. The university part of town is a bit of a walk away from the train station, but the actual old town is quite small and can be easily covered by foot. Make sure not to miss the white storks nesting on the roofs of many prominent buildings, and if you have a chance, buy glazed almonds from the nuns at the Convent of the Clarisas of San Diego. Read more from Yuri Samozvanov here. My December 2016 day in Alcalá de Henares was not the most exciting one I've ever had, though I enjoyed spotting the storks that live all over the city's tall buildings. Although this is still an active university city there wasn’t a lot to do on an overcast weekday in December. I took a look around the archaeological museum and the main university building, but that was pretty much it. The city does have one of the better UNESCO logos I have seen, carved in along with its name in large stone blocks in the centre of a roundabout just outside the city walls. Best WHS logos so far: Alcalá, St Lucia (large wooden carving across a valley from Gros Piton) and Cornish Mining Landscape (depicted in flowers in the town of Hayle). Read more from Tom Livesey here. Alcalá is just a short train ride from Madrid and makes a very interesting half-day trip from the capital. Even though I visited on a Monday afternoon, which meant that many sights such as the cathedral and the Cervantes House were closed, I enjoyed my walk through a city oozing with history. Most tourists come to see the Cervantes-related sights, but the town's biggest claim to fame is the university (which offers guided tours also on Mondays). The Universidad Complutense was founded in the 13th century and was one of the most important ones in the Christian world during the Late Middle Ages and Renaissance periods. When it moved to Madrid in the 19th century, the city became a bit of a backwater (a modern university was founded in the 1970s) and a commuter town. The historic university buildings are still well-preserved and make for an interesting visit. Guided tours seem to be offered only in Spanish, so I didn't catch every detail, but it was still a pleasant visit. From the outside, I also saw the neo-Moorish Laredo Palace and the former Palace of the Archbishops of Toledo, where Columbus planned his first voyage and where both Emperor Ferdinand I and Catherine of Aragon, Queen of England, were born. I visited this WHS in June 2015. It was the last WHS I visited from 8 during my Central Spain road trip and I truly wasn't expecting much. However I was pleasantly surprised to find a vibrant multicultural university town with tip-top condition sites, lots to see, interesting hidden jewels and a nesting base for hundreds of storks. Luckily I had decided to stay overnight and therefore I could dedicate almost 2 days to this WHS. These are the WHS I love most, sites that I would have never visited were it not thanks to the list. All the churches, monasteries, university buildings, towers, walls, etc. were completely dominated by storks, so much so that there was a Stork Route to take in all the sites. This added to the enjoyment as there was always something worthwhile to gaze at when stopping at the different squares. 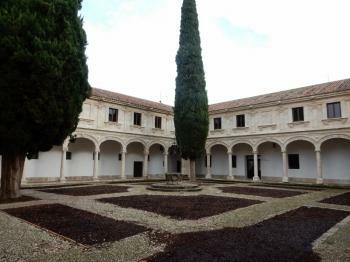 The university facade and courtyard are definitely not to be missed as is the Archbishop's Palace. The Cervantes house is free to visit and there is an excellent tapas bar nearby called Lizarron. My hotel was in the Christian Barrio which is perfect to find parking spaces. The main sites are in the Jewish Barrio and the Muslim Quarter. Inside the university there is a list of the Unesco inscribed universities as well as the Unesco plaque. From the bookshop I would recommend everyone who has the time and who decides to stay overnight in this interesting town to book a guided tour of the university buildings including the hidden jewel of Palacio Laredo on the way to the train station. As far as I know, this is the only way to visit its interior and it really is worthwhile. If you happen not to be in Alcala on Tuesdays and/or Thursdays do visit at least the exterior. It's really beautiful and it really seems out of place. You'd imagine such a building to be in Marrakech not in a busy urban street! Its tranquil gardens reminded me of the Jardin Majorelle in Marrakech. It was really a great way to wind up my visit. All in all I would rank this WHS as one of the most representative that Spain has to offer, not really for a single monument or landmark, but because it offers an honest representation of the different cultural influences in Spain through history. Initially I was rather underwhelmed by Alcala; it just seemed like an unremarkable commuter town. However a slightly rambling wander finally saw me arrive at the grand edifice of the main university building. From then on things started to look up. Wandering around the main campus I was reminded of my own time studying at an historic European university and I was suitably impressed by the way that the long-standing buildings had been updated for 21st century needs, especially in the chapel that has now become a hi-tech library. The buildings were well presented and buzzing with academic life. Unfortunately the tours didn't match up with my own travel arrangements so I had to make do with just wondering around looking like a lost foreign student. The main square was pleasant though nothing out of the ordinary; and the same could be said for the cathedral, though the presence of nesting storks on every roof time was thoroughly enjoyable. After this I headed to Cervantes rebuilt birthplace. It was a nice pleasant place to stroll around and get an idea of what a 16th century abode looked like. There was also a good collection of various editions of Don Quixote, making me think I should finally dust off my copy and get past the first 150 pages! After this I headed back to the station and encountered an unexpected delight in the Laredo Palace a rather wonderful neo-mudjear/ modernisme building that wouldn't look out of place in Eixample in Barcelona. Alcala ended up being a nice little trip out from out from Madrid. I wouldn't say it was particularly astounding; but it was a nice way to round off my second trip to the Spanish capital. The familiar feel of an old European university town was enough to win me over despite its sometimes work-a-day appearance, and the direct association with a colossus of Western literature is a lovely added bonus. My memory of this picturesque town is of sitting in the Plaza de Cervantes having a picnic lunch watched by a dozen or so storks. These ungainly birds seem to have taken up residence of the roofs of many of the surrounding buildings. Alcala de Henares, a small town near Madrid, is a home of Spain’s most prestigious university and the birthplace of great Spanish novelist, Miguel de Cervantes, so this city breathes with two things – university and Don Quijote. As the first planned University town in the world, Alcala de Henares is another example of city planning on the World Heritage List; however, this special characteristic is less obvious as I think this town is just a typical Spanish town in term of urban layout. The prime attraction of the town is university (for sure) which is situated in the town centre area. Strolling around this large and beautifully constructed in Spanish renaissance style university complex is a very nice experience. The must see is the amazingly Paraninfa Hall where the Spanish monarchs give out annual Cervantes Award to outstanding writer. Alcala de Henares was a prosperous town, in the historic precinct, which is just next to the university, has many nice and attractive balconied buildings and churches. The large city square with a statue of Cervantes is a really surprised as it gave an Italy reminiscent to me. The main reason for most tourists who come to this city is Cervantes Museum which is located on the site believed to be his birth place. The museum is OK with many objects from Cervantes period or the scene from his novels. The most disappointed from this museum is no one can speak English, but it is a free museum so I didn’t expect much for language service. In front of the museum is a statue of Don Quijote and his partner, Sancho Panza with a long queue of tourists who want to sit between them for a good photo opportunity. Alcala de Henares seems to be a quite popular place for Spanish tourists with considerably amount of restaurants and souvenir shops; I hardly heard any foreign languages except Spanish. I think the town has a horse riding school, as I saw many students rode their horses to the city centre making the town’s atmosphere more memorable with the old time charm. I even saw one guy withdrew some money from ATM while he was sitting on the horse! What’s a combination of old and new worlds! This town is a true jewel of Comunidad de Madrid and should get more attentions from foreign tourists even though I afraid the charm of the town will lose forever with the influx of tourists like other WHS. From Madrid, there have many frequent suburban trains connect Madrid with Alcala de Henares in just less 50 minutes. Alcalá de Henares is a nice town, with a long history and a fabulous old University building. It's a universitary town therefore you see here a lot of students from many places of Spain and the whole world. It's only half an hour from Madrid so perfect for a day tour. I lived in Alcala for 2 months in the summer of 2004. The people are amazing, the city is beautiful and so much fun. It almost makes me cry to write this I miss it so badly. We travelled out to Alcala de Henares from Madrid by train. Althought it has its origins back in Roman times, it is now a lively university town with lots of your people around the place, and lots of outdoor spaces in which to sit and contemplate the fine architecture. As a bonus you can visit Cervantes' birthplace and immerse yourself in his books and life. Hi, I am living already in Manchester, UK, but i was born and lived in Alcala de Henares all my life. I would just like to tell you how beautiful this place is. We spanish people are really friendly and are always happy to welcome visitors who respect our place. I hope you come to madrid, that is at 20 miles from alcala, and enjoy my city even for only one day. Spring is marvellous and the city looks amazing!!!. 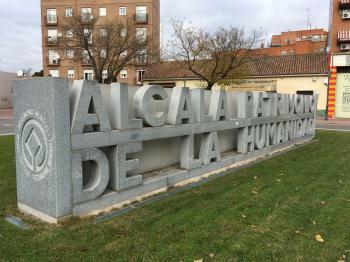 I am a tourism management student and i have been in many places, but nothing can compare to Alcala!!! Hope you come and visit!!! 179 Community Members have visited.